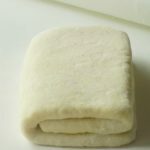 You can easily make homemade quick puff pastry in 15 minutes! If I have to number the desserts I love, mille-feuille is in my top 5 list. Puff pastry with its crisp texture and pastry cream with its soft texture make a nice combination. As I always want to make everything from scratch, when I found this quick puff pastry recipe, my eyes sparkled. It takes only 15 minutes. Yes, you heard it right. It takes only 15 minutes in total which means that you don’t have to wait 30 minutes between each turn. Besides that, the method is very easy, very different than the traditional one. You don’t need to roll out the block butter. This recipe is a saver for me! The key to success in this recipe is working very fast. If you work in a cold environment, you don’t need to take the dough into the refrigerator to cool during your steps. However, in my first attempt, the butter got warm quickly. 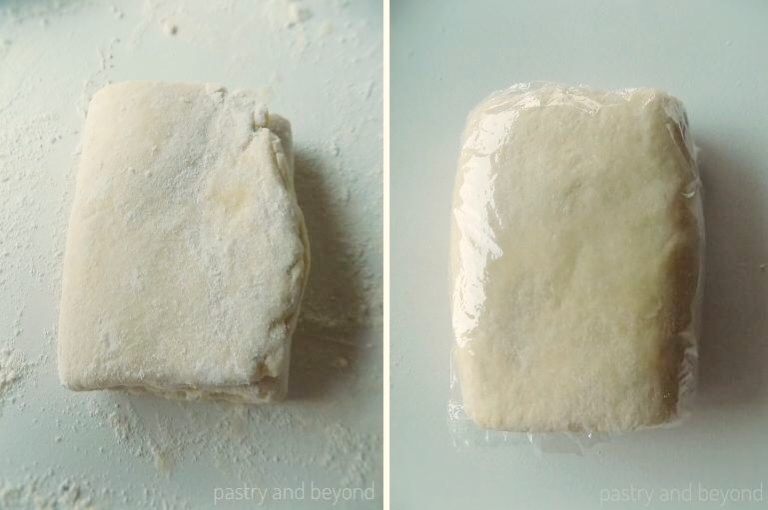 I found a solution to keep the butter cold while making this quick puff pastry. Let’s go through the stages, so I can share my way of working. First, I mix the flour and salt in a big mixing bowl and add the butter that I keep in the freezer. (I always keep some of my butter in the freezer.) Then I cover the bowl with a plastic film and keep it in the freezer for 10-15 minutes. I make sure that I use a bowl that can be put in the freezer. Later, I take the bowl from the freezer and I use my pastry scraper to cut the butter into the flour. If you have a pastry cutter, it is even better. I try to cut the butter in small pieces but there are some pieces in the size of peas which are fine. The cold mixing bowl helps the butter not to warm quickly and helps the work surface to be cold, which helps me a lot when I roll out the dough 😉 If you work in a cold environment, you don’t need to put the mixing bowl in the freezer. I create a well in the center of the flour and pour in the ice cold water. Then I take the flour mixture from the sides and start to mix with my pastry scraper. I don’t use my hands as my hands can warm the butter easily. So I keep working with my pastry scraper. I only use my hands at the end to bring the dough together which takes a little bit time. I am not trying to make a perfect ball not to warm the butter with my hands. You will see butter pieces in the ball which are normal. Then I put the dough onto a work surface which is cold because of the mixing bowl. I flour my work surface and rolling pin so the dough doesn’t stick to either. Later, I roll out the dough into a 10- inch (25 cm) long rectangle. I add more flour as needed. Before folding, I brush off the excess flour with a pastry brush. I fold the dough in three. I fold the bottom one-third of the dough towards the center and the top third over that. While I am folding, I brush off the excess flour as needed. It is like folding a letter that needs to fit into an envelope. After that I give the dough a quarter turn. Then I make the same steps at least 3 more times; rolling out the dough and folding, giving the dough a quarter turn… Each time the rectangles get neater. After my dough is ready, I wrap it in plastic film and keep in the refrigerator at least 1 hour or in the freezer 30 minutes before I use it. I am looking forward to share mille-feuille, palmiers, countless recipes with this quick pastry dough. 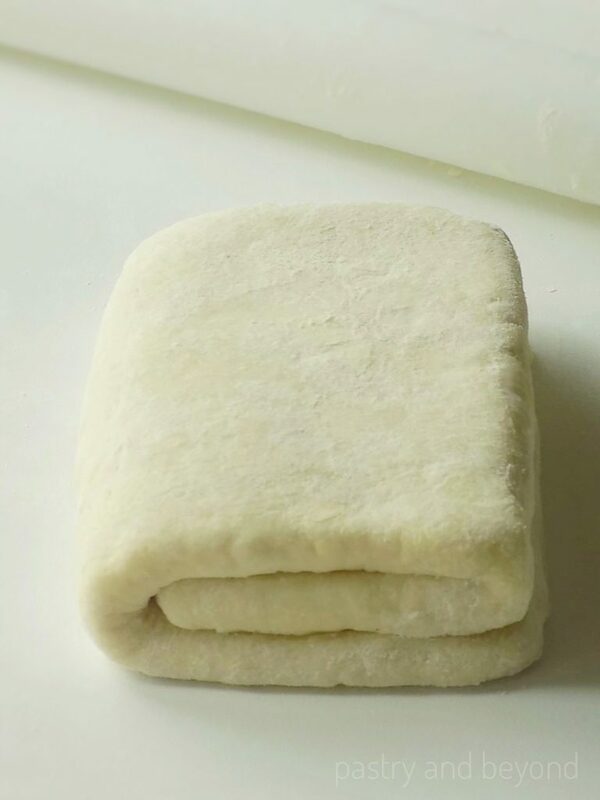 You can easily make your homemade quick puff pastry in 15 minutes! Make a well in the center of the flour and pour in the ice cold water. Take the flour mixture from the sides and start to mix with pastry scraper. Don't use your hands as they can warm the butter easily. 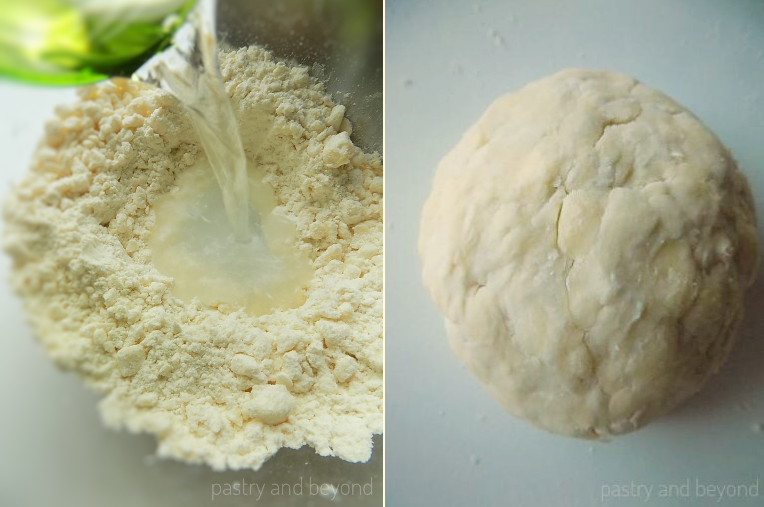 Use your hands quickly at the end to bring the dough together and shape it into a ball. Put the dough onto the work surface. Flour the work surface and the rolling pin so the dough doesn’t stick to either. 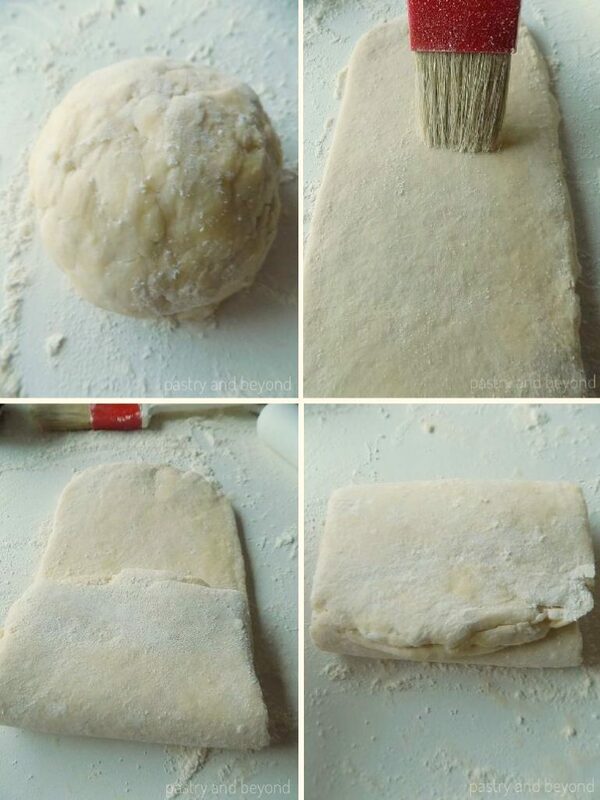 Roll out the dough into a 10 inch(25 cm)long rectangle. Add more flour as needed. 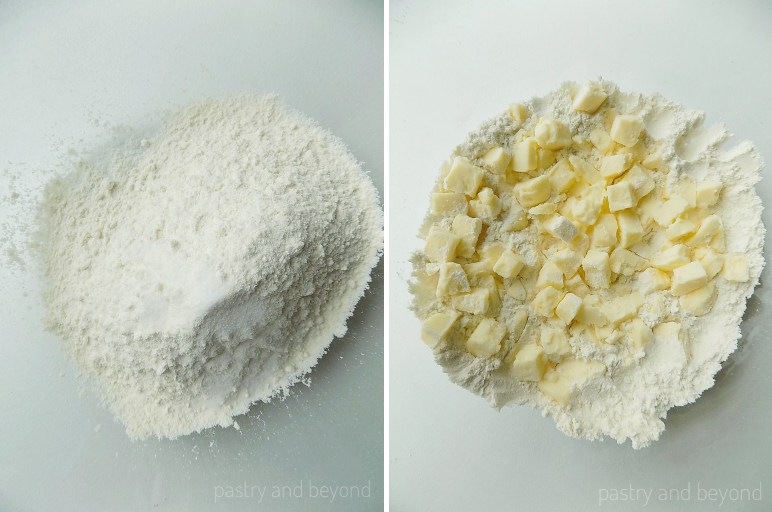 Brush off the excess flour with a pastry brush. Fold the bottom one-third of the dough towards the center, and the top third over that. 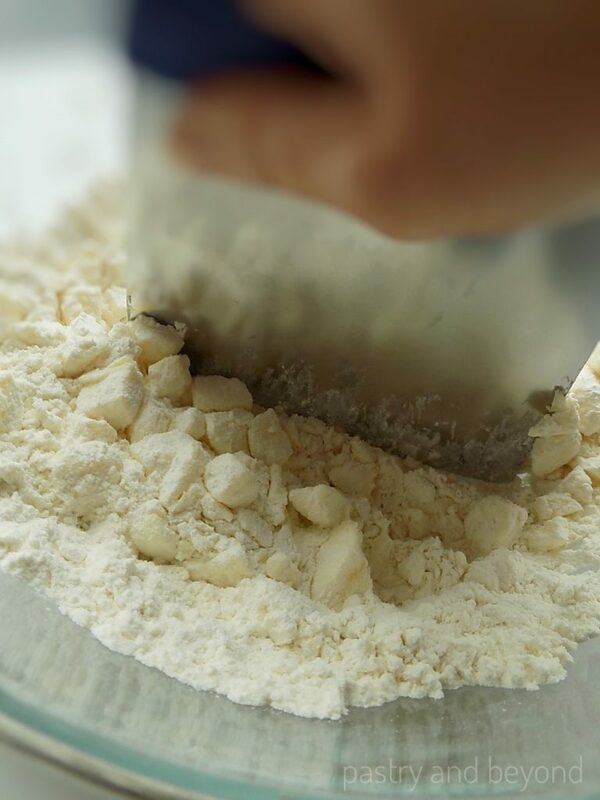 While folding, brush off the excess flour as needed. Give the dough a quarter turn, and make the same steps at least 3 more times up to 6 times. Wrap the dough in plastic film and refrigerate at least for 1 hour or freeze 30 minutes before using. *You can click here for dip and sweep method if you use cup measurements. The calorie information above is an estimate that is provided by an online nutrition calculator. 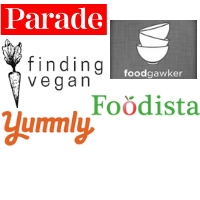 Copyright © 2019 Pastry & Beyond. Powered by WordPress. Theme: Spacious by ThemeGrill.